I'm shooting a found (don't remember where I got it) medium format Imperial Debonair. 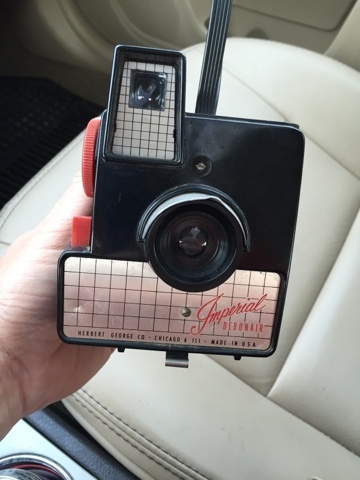 A retro looking plastic camera. Unlike a look down Kodak Brownie this camera has a look-thru viewfinder. Shoots 620 sized film. This film size is hard to find. I bought a roll online from Film Photography Project store and loaded it up. After 5 shots the film jammed. I opened it up in a room with the lights off. The top spindle had popped off. I snapped it back on, and shot another photo. Jammed again. Opened it up, and put the spool back on. Hopefully I can finish the roll.